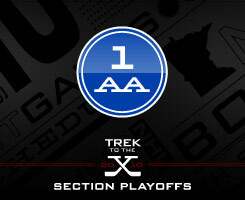 Section 1AA appears to be there for the taking for No. 1 seed Lakeville South (16-9-0). The Cougars romped past the teams considered their biggest threats to take the section crown, routing No. 2 Rochester Century (17-7-0) by a 9-1 score on Jan. 19 and shutting down No. 3 Lakeville North (8-15-2) twice by a combined score of 9-1. South has been buoyed by a super-rookie line of sophomores Justin Kloos and Alex Harvey and freshman Kyle Osterberg, who are the top three scorers on the team. Moving up from bantams isn’t usually this easy. If they can continue their regular season magic into the postseason, the Cougars won’t be beat in 1AA. Yet Century should never be counted out in playoff hockey, especially under the only coach they’ve known, Bruce Frutiger. The program has been around for a dozen years (this is the 13th) and it has advanced to the section final eight times, including winning it in three of the past five seasons. As a fourth seed last winter, Century upset both of the top two seeds to get to state. No team is as loaded between the pipes as the Panthers, who start sophomore Brock Kautz much of the time. Backing him up is last year’s starter, Cam Sellnow, who took Century to the state tournament last winter. Lakeville North doesn’t have a great record, but it did finish in the middle of the pack of the tough Lake Conference. It was enough to boost the Panthers into a top-three seed and a likely semifinal rematch with Century. 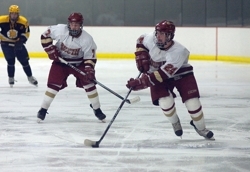 The two teams played in the season opener, with Century taking a 4-1 victory. North’s best results this year are both against Bloomington Jefferson, beating the Jaguars 6-4 on Jan. 9 and tying the Jaguars in the season finale, 4-4. The section dark horse could come out of the No. 4 vs. No. 5 game between Winona (17-7-1) and Owatonna (8-13-4). The Winhawks are a senior-laden team that has been pointing to this season for a while. With a high-powered top line that has scored a combined 81 goals and senior goaltender Garret Welle, Winona could cause any team in 1AA trouble. Unfortunately for them, the Winhawks drew Owatonna in the first round, a team that already beat them 4-1 back on Feb. 4. They’re apparently called the “Penguin” line by their teammates, based on the faux military humor of the penguins in the movie “Madagascar.” But Lakeville South’s young line of sophomores Justin Kloos and Alex Harvey and freshman Kyle Osterberg have been much more efficient and successful than their movie counterparts. The trio has paced South’s surprise season, and the linemates rank as the top three scorers on the team, with a combined 62 goals and 139 points. Kloos has missed the past few weeks because of injury, though, and his return could be a key to the team’s playoff chances. On the opposite end of the spectrum is Winona’s all-senior top line of Jay Moran (pictured at right), Aaron Theis and Kyle Florin, which has combined for 81 goals and 179 points. They’re a quick bunch who have played together on varsity for several years now. Despite not being ranked in the Class AA top-10 rankings, the Cougars are as big a favorite to win their section as any program in the state. South played three games against the next two seeds, beating them by a combined 18-2 score. The only thing that might derail the Cougar train is inexperience, as the top three scorers are all underclassmen. The fifth-seeded Huskies are playing against another possible bracket buster in No. 4 Winona. But Owatonna has the edge after beating the Winhawks 4-1 on Feb. 4, outshooting them 24-14 and getting a three-point night from Aren Peterson (a goal and two assists). Owatonna will need to find some scoring, as they averaged just 2.80 goals a game.